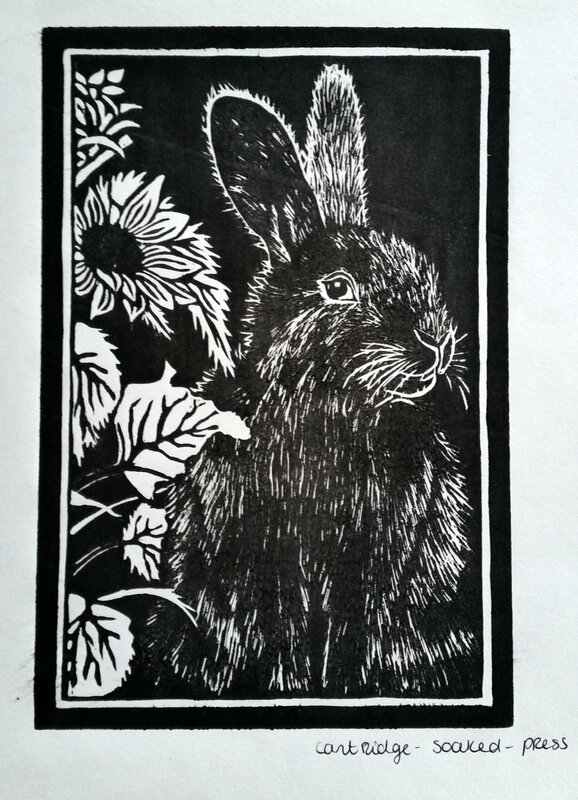 Woodcut printing has always been a fascination of mine. Although woodcut printing is very similar to lino print, there are a few differences to keep in mind when cutting and printing a sheet of Japanese plywood. The most obvious one is that wood has a grain to it and cutting the plate by following the direction of the grain makes life a lot easier. I find the simple act of cutting into the wood very enjoyable and satisfying, even more so than when cutting a sheet of lino. I also like the slight texture of the wood grain that appears on the prints. I find it gives it a lovely authentic feature. 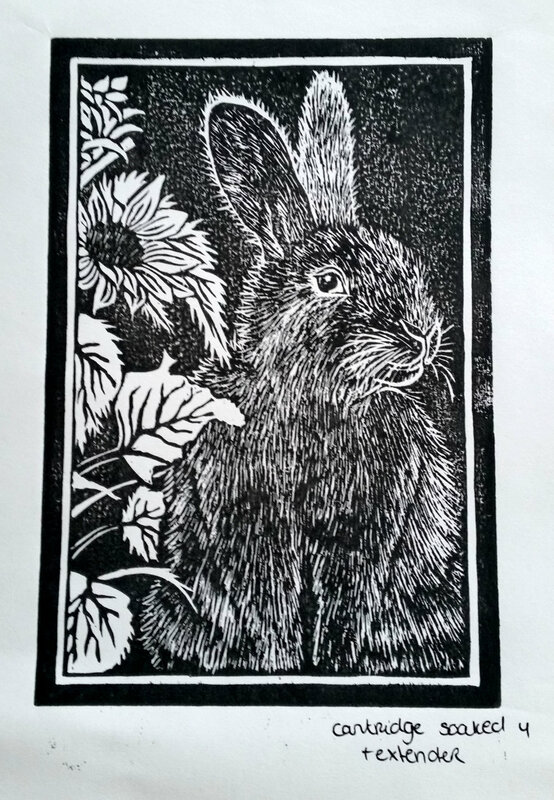 Another difference that I have noticed, is that the woodcut plates do not print as easily as a lino plate. 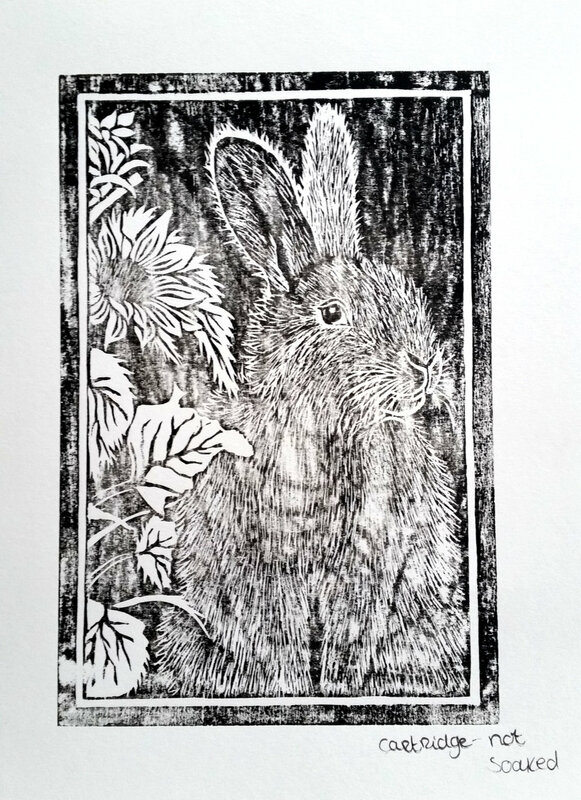 I have struggled with making a print where the ink is evenly distributed on the paper with no white patches. The prints I made in the past were very hit and miss. I have come to think that this may have to do with the wood being more absorbent then the plastic or oily nature of lino. To try and find a solution to this problem, I wanted to do a little experiment: does using slightly damp paper help with getting better prints? When making dry point etchings, the paper must be slightly damp, so it will pick up the ink better from the engravings. I wanted to explore if this may help ‘draw’ the ink from the wooden plate better too. I also tried using a standard thickness paper (130 gsm drawing paper) versus a thicker paper (300 gsm watercolor paper) to see if this made any difference. For this experiment I decided to create a new woodblock. As we are nearing Easter, I made a little design with a cheeky bunny. I used a Japanese Professional grade Shina Ply (Tomo-shin), which can be bought in the UK here. After cutting the design, it was time to get some printing done. I first got some paper ready to soak. This is done by simply placing some sheets of paper in a layer of water, making sure the top of the paper has been submerged too by pressing it down slightly. The thicker the paper, the longer it needs to soak. I left the thinner drawing paper for a few minutes and the thicker watercolor paper for about 10 mins. I then took the paper out of the water and placed it between 2 sheets of blotting paper. Blotting paper is a highly absorbent type of paper and it is used to absorb excess liquid from the surface of the printing paper. 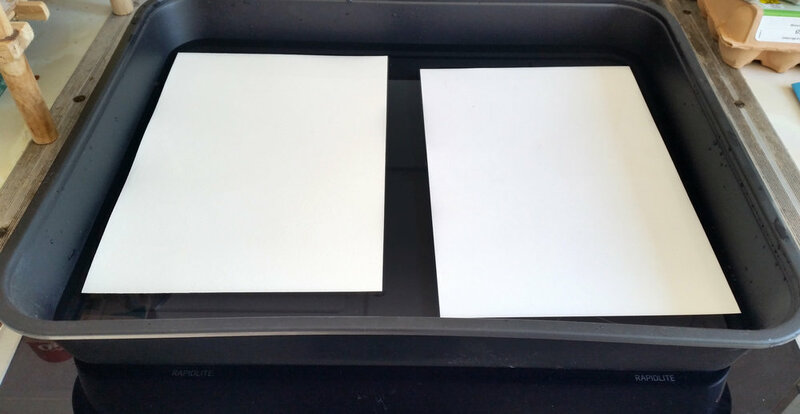 When your soaked paper has no shiny wet patches left on it, it is ready to be used for printing. The first print was made on non-soaked drawing paper. The results are obviously not great: the print came out very patchy, almost like the paper did not pick up all the ink. The second print was made on soaked cartridge paper. The results are much better. The paper picked up much more of the ink and it has made a nicely even print with only a few white patches. The third print was made on soaked watercolor paper. I was hopeful for this one, as the soaked cartridge paper I used before worked very well. Unfortunately, it didn’t come out as well as I hoped. The ink is much patchier on this thicker paper. Maybe this thickness is the problem? I went back to printing on soaked cartridge paper, as this gave better results. I wanted to aim for an even better print then the first one and make sure to get rid of all the white areas. I thought maybe rolling a bit more ink on the plate would be the solution. But as you can see, it solved the patchiness problem but added another. The white patches have disappeared, but the ink crept into the crevices that I carved into the wood and I lost many of the marks made I made. While I was printing, I found that the ink was drying very quickly and was becoming sticky. I recently bought some ink retarder (Speedball Block Printing Retarder), which claims to slow down the drying time of the ink. I decided to add some to my ink and see if this made a difference. I used soaked cartridge paper again. It looks like I regained some of the marks made in the wood but lost some of the evenness of the black ink: some white patching has reappeared. The next print I tried adding some extender to the ink. Extender (Speedball Block Printing Extender) is normally used to make the ink more translucent or transparent. Again, the marks in the plate have come out well, but the ink itself is becoming patchier and less intense black. All the previous prints have been hand printed. I just wanted to see if using a press would have any influence on the prints. Again, I used a piece of soaked cartridge paper. By using the printing press, I was able to make a lovely even black print without any white patches, but due to the increase in pressure, some of the ink bled into the grooves of the plate, which lead to loss of markings in the print. 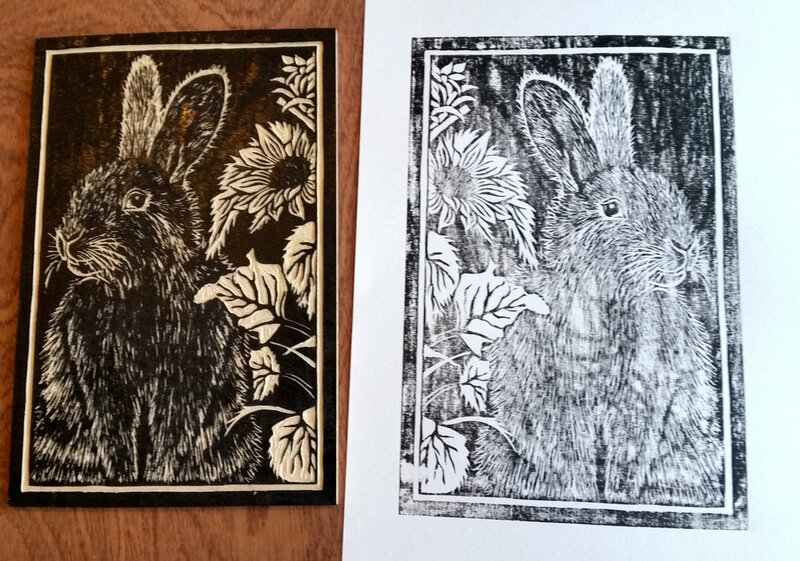 From all the different ways I tried printing a woodcut plate, it seems that I have yet to find the ‘perfect’ print. But I have seen that soaked drawing/cartridge paper has worked the best. The slight dampness of the paper seems to make a large improvement on how the paper picks up the ink from the plate. Using the press highly increases the likelihood of a evenly printed print, but using the right amount of pressure needs some figuring out. I think the future will hold more experimentation on how to get a nice print. Using thick paper seems to be ineffective, so I am wondering if using even thinner paper (maybe saving up for some traditional Japanese paper off 90 gsm or even thinner?!) will improve the rate of success.